In 1842, an engraving of Haliburton House - or Clifton as it was originally called - appeared in Canadian Scenery Illustrated with a caption describing it as "a small but elegant structure, delightfully situated on an eminence, which ... commands a noble prospect of the whole township." 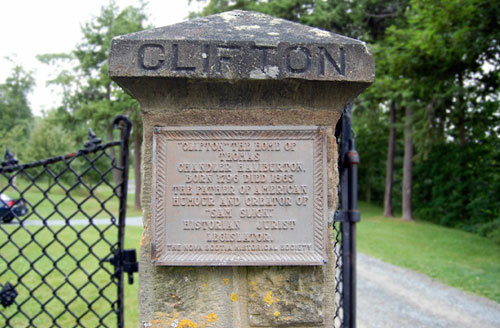 At the time, it was home to Thomas Chandler Haliburton, a prominent business man, judge and author of the immensely popular Sam Slick stories. Today the house looks quite different than in Haliburton's time. After it was sold and the contents auctioned off, successive owners altered and added to the house. Enjoy the scenic grounds and the municipal walking trails that take you from Haliburton House to the bottom of Ferry Hill near Shand House Museum, land that was once part of Haliburton's property.